New Jersey "Mormon Helping Hands"
Hurricane Irene A few weeks ago the Eastern coast was hit by Hurricane Irene. For safety precautions, forty missionaries living in low-lying areas were evacuated to higher ground. Luckily, except for fallen power lines, trees and power outages, the New York South Mission did not suffer much structural damage. In New Jersey things were different. 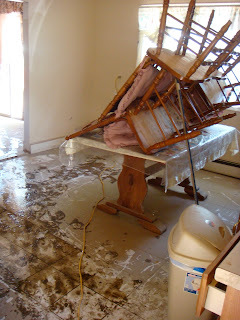 The storms from Hurricane Irene flooded many areas. Then Tropical Storm Lee hit five or six days later and flooded the same areas again. Many of the homes were inundated with up to 6-8 feet of water. Some of the homes had only their roofs visible. Help. The NY South Mission received a request for help. So on Wednesday, Thursday and Friday, September 14-16, we bused our mission to New Jersey which is about an hour and a half away (a third of the mission went each day). On the weekend, members from the wards and branches were bused over to New Jersey. On Sunday, church services throughout the mission were shortened to a ½ hour Sacrament meeting. The members were instructed to meet at the church wearing their flood clean up clothes. 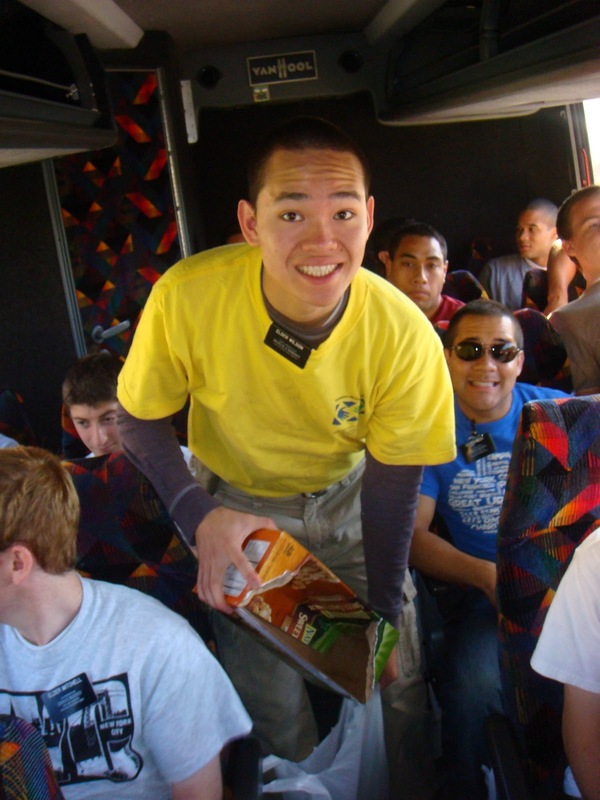 They participated in the sacrament and then boarded the buses to New Jersey. Clean up (“Mucking Out”). The clean up project was coordinated through Salt Lake City. 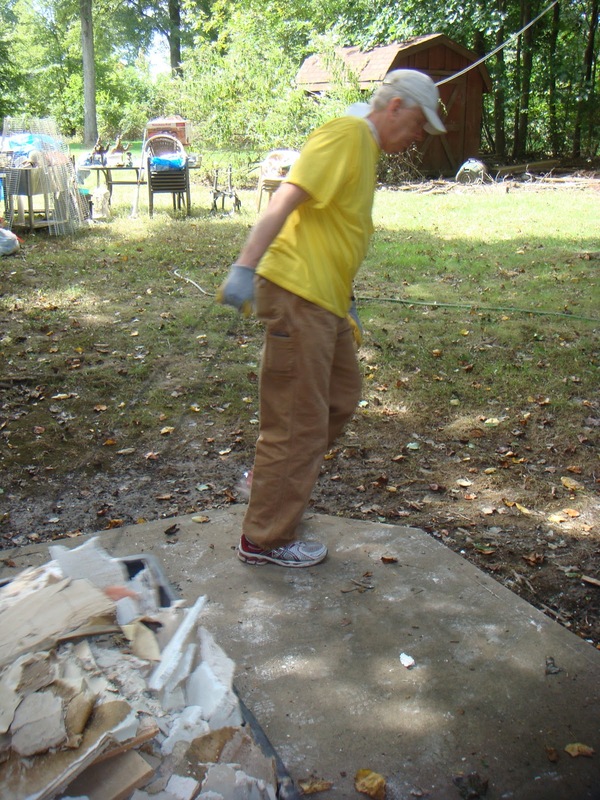 In May the Church called a volunteer couple from Utah to oversee disaster relief projects throughout the United States. They work from their home in St. George. When there is an emergency or disaster, they leave their home and travel to the site to help coordinate the project (since May, they have only been home one week). Those who are in need of help are put on a list. A truck full of equipment and supplies is sent from Salt Lake, including yellow Helping Hands t-shirts for every participant. Before beginning any work, the neighborhoods are canvassed and information gathered. Teams of ten are organized and assigned to individual cars (our missionaries “hooked up” with the missionaries from New Jersey). Instructions are given(no monetary donations accepted--no proselyting, please). Everyone is supplied with a lunch and a “sled” full of clean up supplies—shovels, brooms, crow bars, etc. is sent along with each team. The “sleds” are used to haul the debris out of the houses. Clean up entailed stripping many home of the walls, floors and ceilings and leaving only the studs. Because of the water, the walls had the consistency of wet chalk. A serious problem comes from the quick onset of black mold, which even after the cleanup makes some homes uninhabitable. When the project is completed, a relief bucket from the Church is left at the home with a day or two supply of food and a few supplies. "It continues to amaze me to see the depth of organization the Church and the capability it has to quickly and efficiently reach out to others in need, not only in the United States, but throughout the world (Japan, Brazil, Africa, etc. etc.)" "The elderly man that we helped had cancer that had spread “like crazy’ to his liver and other organs. Six months before he had lost his wife. His insurance informed him that his damage would not be covered. In spite of this he was smiling the whole time and didn’t complain once. When we finished, he pulled out a wooden box full of tie clips and cuff links and gave them to all the missionaries (they were all were all wearing them at our next meeting). " In our Zone conferences this transfer we are discussing our purpose as “…instruments in the hands of God to bring about (His) great work” (Alma 26:3), emphasizing that our role is to invite and help people to be baptized. We are using Alma 26 as our discussion base. In verse 22 Ammon states “…he that repenteth and exerciseth faith, and bringeth forth good works, and prayeth continually without ceasing” …shall be given to bring souls unto repentance (baptism). I love that verse because it clearly identifies the need that we have as missionaries to continually repent and exercise faith in order to magnify our callings. In our August Zone Leader Council we talked about the fact that we must constantly be striving to change and “…yield our hearts unto God.” (Helaman 3:35), refining our understanding that improvement must come based upon the real desires of our hearts. Our hearts change only as we desire that change and exercise faith and work (as Ammon said in verse 22). As we discussed this reality, many Zone Leaders talked about missionaries in their zones who are focusing on strengthening the Christlike attributes described in Chapter 6 of Preach My Gospel. Only as we strive to become more Christlike will we be able to magnify our callings. Only as we pray with all the energy of heart for an increase in charity, and as we are obedient and pray for increased faith, and as we are diligent in our work, will we really change and grow into the mighty servants the Lord so very much wants us to become. Elders and Sisters, we call all to do better. We must continue to change and grow so that we, too, can be more effective in bringing souls to repentance. We love you and consider it a blessing to be here with you. In July, under the direction of the Plainview Stake Long Island pioneer reunion was organized. 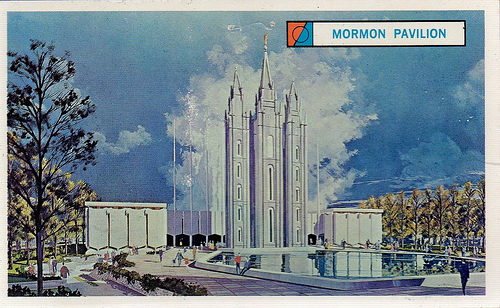 Histories were gathered, and tours were planned of Mormon historical sites. In the stake center cultural hall, histories, stories, photos, testimonies, etc. were posted for all to read. The far-reaching effects of the 1964-65 World Fair were re-told. Everybody that had ever been a member of the stake was invited to the reunion. Many came back to renew old friendships and to share their testimonies. The Eastern States Mission was the second oldest mission in the Church. The New York South Mission is one of the descendents of that Mission. The British Mission is the oldest. In 1837, Parley P. Pratt was called as the first mission president. Mormon Hole. Here in 1837 Parley P. Pratt baptized the first 100 Saints initiating the oldest continuous Mormon Community in the World (now almost 200 years old). The Saints were then called to gather to the West in October 1845. Some left to join wagon trains, and others boarded the ship, Brooklyn. Mormontown. Some families who owned farms in the area--the Sopers, Browers, Bedells and Pettits--were asked to remain in Christian Hook, then called Mormontown (now Oceanside). They continued farming to help supply the European immigrant Saints with food and supplies necessary for their trek West. Thus, Long Island became the first stopover on the Mormon trail. The Sopers were instructed to go West as well, but never did. They could see the potential growth and hoped to get rich by eventually selling their property. However, the Great Depression hit and it never happened. The last Soper, an antagonistic old man, died in poverty living in a old shack warmed only by a stove in the middle of the room. It stood on the last acre of what was left of his land. The Soper Home. From 1846–1869 the Saints met in Aunt Nauchie Soper’s” living room. Wilford Woodruff and John Taylor were some of the mission presidents during this time. Mormon Cemetery Where the earliest Saints buried their dead now remains only a mound of unmarked graves. 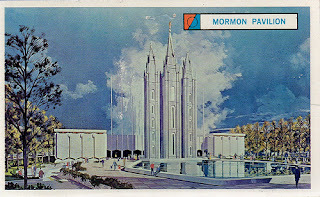 Worlds Fair Mormon Pavilion (1964-1965) Because of the Worlds Fair there was a huge strengthening in the Church on Long Island. Over five and one half million people visited the Pavilion. This resulted in thousands of referrals. Because of the Mormon Pavilion, the membership of the Church in Long Island doubled. Plainview Chapel. After the Fair, the Mormon Pavilion was disassembled and the panels, weighing over 13 tons each, were dissembled and transported to Plainview. They now make up the outer walls of the Plainview Stake chapel. They had one extra panel that they couldn’t use, so they buried it under what is now the parking lot. *President John Baileycompanionships and the mission every month. In addition, every four weeks, President Bailey had to interview all the missionaries. In order to talk to every missionary in the mission, the limit for each interview was 6-7 minutes. Zone conferences were also held during this 4-week period. The New York South Mission “weathered” Hurricane Irene. When it hit us, it had been downgraded to a tropical storm. There were downed trees and power lines, but little structural damage. Other states did not fare as well. Trees are always falling down here during storms—they are very old and very tall. Actually a small tree did fall on a neighbor’s home (no damage). And a large “chunk” fell out of the sky (our tree) outside President Nelson’s mission home office during an interview taking the sister missionary being interviewed by surprise. It took four elders to haul it off. Emergency Storage: A mission project to be prepared had just been completed some months before the storm. Each missionary had been instructed to buy a three day supply of food and water (one gallon of water/day). Also, the mission has always supplied arriving missionaries with an emergency kit containing basic emergency supplies—medications, bandages, a bar containing needed nutrients for three days (the missionaries refer to it as “the brick” and pray they never have to eat it), and other supplies. No Power. Hurricanes can be unpredictable and preparations always need to be made. In preparation for the hurricane people in specified areas on Long Island (areas near the ocean in danger of flooding) were instructed to evacuate. Missionaries in these areas were evacuated to the apartments of other missionaries, as well as the mission home. There were about twenty missionaries staying in the mission home with President and Sister Nelson. The only problem with that was that the home was without power for three days. (b) A BBQ can be used as an oven. (c) Canned vegetables can be heated up by running hot water over them (nobody ever suspected). Luckily, we had hot and cold running water! (d) Don’t plan on finding any ice in the stores—it’s long gone. The mission home has a commercial fridge and freezer that kept things cold, so we had some backup food. It just had to be eaten before it thawed. Sacrament Meeting at the Mission Home. Baby Blessing. On the last night, still without power, we hosted a baby blessing in the home with 25 people in attendance. Some of the family members didn’t belong to the church, so they wanted to have it in a home instead of the church. The baby was blessed by candlelight—it worked. Luckily, that dinner was a potluck and Costco did have power (menu--Sister Nelson’s infamous Costco ham, Costco cheese, and Costco croissant sandwiches). And someone from the neighboring town actually brought ice! (see Sister Nelson’s “Fresh Ice Recipe”—following article). Downside: Since the two bathrooms in the basement were out of commission because they are powered by an electrical pump, thirteen elders had to share one bathroom. Upside: Because of the hot water, they did all get hot showers—affectionately referred to as “rinses” due to their short duration. Recommendations: A generator would have been nice. Homemade Ice. Ice cubes come in handy for parties and events; bags of ice cubes and crushed ice for cooling and chilling food and drinks! Pour water into ice trays and then place trays in freezer. Take out when frozen and serve. When time does not allow for homemade ice cubes or when you are stressed about “what to bring” to a potluck, you can always bet there will not be enough ice and it will be appreciated by all. Go to any retail market or quick mart and buy a bag or two as needed. Enjoy! Note. President and Sister Nelson go to Bermuda three times a year. They have a district meeting with the Elders and Senior missionaries, meet with the branch presidency and members, do Temple Recommends and other needed interviews and attend and speak in the Sunday meetings. The only “beach time” they get is when there is a baptism. The little historic chapel doesn’t have a font. Temple Trip.In December, some of the Bermuda members will be making a temple trip to New York for sealings, endowments and baptisms for the dead. They will be staying at the mission home in Port Washington. We’re excited to see them. A sister missionary was calling some names of people who had been formerly contacted, but had decided against receiving any more information. A man answered the phone. Jesus was his name. He told her that he had talked to missionaries before (it was the last name on an old 2007 list of names), but that they had forgotten him. The Sister asked, “You mean the ones in white shirts and ties? He said, “Yes, I haven’t forgotten you, but you had forgotten me. The missionary asked him if he wanted to know more. He said that he always wants to know more. The problem is that he works in New Jersey. He doesn’t even have a day off. He leaves at 5:00 in the morning and leaves work at 8:00 at night. He did say that his schedule will be changing. The list that she was calling was two pages long. His was the last name on the list. The August 2011 “Arrivals” from the Missionary Training Center in Provo, Utah are as follows: *NOTE: The Candlesticks! This picture was taken right after hurricane Irene paid us a visit.